This Fall, we are partnering with NAEYC’s Global Engagement Division on some exciting international work! 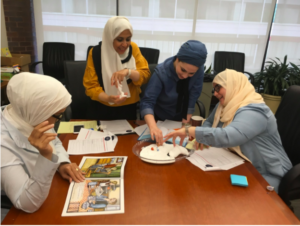 SRC’s practice team, which promotes best practice by building instructional leadership and educator capacity, will work alongside NAEYC and a delegation from the Kingdom of Saudi Arabia (KSA) providing training and technical assistance to support the development of Saudi Arabia’s national early learning curriculum for ages 0-6. The delegation includes teachers, trainers, administrators, university professors, and Ministry of Education leaders. The SRC team is accompanying the delegation on an early learning study tour, starting with preschools in Gothenburg and Stockholm, Sweden; continuing with high-performing programs in DC; and ending with preschools in Denver and Boulder, Colorado. 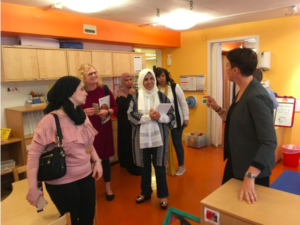 Over the course of the study tour, delegation members have the opportunity to study and observe preschool programs using Sweden’s national play-based curriculum, High Scope, Creative Curriculum, Reggio Emilia, and Montessori-inspired early learning settings. The programs they observe occur in a wide variety of political, social and economic conditions, with childrenwho speak over 100 different languages. In November, SRC will visit Saudi Arabia to provide additional training, and to work side by side with the delegation to begin to bring their national curriculum to fruition. SRC is excited to apply our commitment to high quality early learning opportunities for all children on an international scale.